Proof that the travesty of animal welfare masquerading as business is not just a U.S. phenomenon. As the following articles show, the inappropriate care and dumping of iguanas and other reptiles is no longer something that happens mostly in the United States. As exotic animal exporters expand their markets, it just spells death to an increasing number of animals. To use the excuse of, "Well, their habitat is being destroyed anyway" simply does not cut it. Once all the forests are down, it isn't just the furred and feathered, scaled and chitined organisms who will be affected - environmental destruction affects the entire energy web, including the consumers at the top: humans. Bangkok's middle-class citizens are not paving their city with gold these days, reports Cimi Suchontaon in the independent Bangkok Post. Instead, they are lining the streets with dead iguanas. People buy the Western pets to impress their friends but don't have the foggiest notion of how to take care of them. "When the pets cease to amuse their owners, they dump them in the forest," says Secretary-General Pisit Na Patalung of the Wildlife Fund of Thailand. But the South American iguanas perish because they do not know how to survive in the Thai habitat. Some 3,000 iguanas are sold each week in Bangkok. Small ones sell for about $30; bigger ones cost up to $400. ROME - Steven Spielberg brought dinosaurs to life in movies like "Jurassic Park" and "The Lost World." He also may have started an iguana invasion in Italy. The World Wildlife Fund said Monday that thousands of the reptiles are being imported into Italy to satisfy movie fans who want a "dinosaur" of their own. 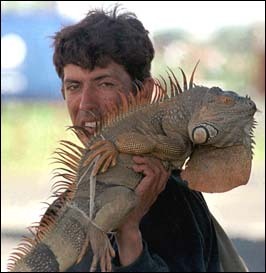 The problem is that iguanas, like all pets, grow up. And when they do, they can reach 3 feet in length - too big for most owners. "Iguanas remind people of little dinosaurs. But people who buy them as pets soon realize they are difficult and expensive to look after," said Cristina Maceroni, a World Wildlife Fund spokeswoman in Rome. The World Wildlife Fund says Italy imported more than 3,000 iguanas legally in the first half of 1997. It estimates another 1,000 were smuggled in. That compares with 5,000 iguanas for the entire previous decade. "The demand for iguanas is growing at an alarming rate," Maceroni said. "We believe this is in part due to the success of 'Jurassic Park'. The same thing happened with Dalmatian dogs following the release of Disney's '101 Dalmatians'." Unwanted Iguanas Trouble for L.A.
LOS ANGELES -- Pet iguanas used to be a big fad, but now the iguanas are big and the fad has faded. Rescue organizations say they can't handle any more of the unwanted lizards, and the city is considering regulating their sale. "What we really want is anyone thinking about getting an iguana to know that a 6-inch iguana could be three feet in two years," said Gini Barrett, president of the Los Angeles Animal Regulation Commission. Joe Ventura, an inspector for the U.S. Department of Fish and Wildlife at the Port of Los Angeles, said about 2,000 South American iguanas come through each month, although the number lately has tapered off. Even more come through Miami. Imports were driven by the development of a large Latin American breeding industry. The oversupply drove prices here down to about $20 a few years ago. "We get two calls a day here at the zoo from people wanting to place their iguanas," said Russ Smith, reptile curator at the Los Angeles Zoo. Smith has to decline because there's no room. "In the last couple years, it's mushroomed," he said. The nonprofit Wildlife Waystation, an animal rescue group, has far more than 100 abandoned iguanas and won't take any more. "We get calls daily," said Martine Colette at the Waystation in Tujunga. Still barely domesticated, iguanas grow until they die. A pencil-length green lizard that makes a cute Christmas gift may be 6 feet long within a few years. Iguana fanciers say they are more intelligent and responsive than other reptiles, but males can be aggressive and territorial. Though not usually considered dangerous, iguanas have pointed teeth, sharp claws, and surging hormonal cycles. They can injure an arm simply by hanging on, Colette said, and they can move faster than people. "They need room to roam," Colette said. "Pssst! Wanna buy an iguana?" Sold at a price cheap for tourists, but a boon to the locals doing the selling, wild iguanas can be bought on the streets of many villages, towns and cities throughout their native range. Some of the buyers will try to smuggle them out of the country when they go home, only to be caught and the iguana confiscated. Others will buy them to rescue them and set them free - but often not far enough away to prevent the iguana from being captured and sold again. As long as tourists buy these iguanas - or any other wild-caught animals sold on the streets and in stores - the locals will continue to go out and capture them to cater to the tourist trade. They don't care if the animals are confiscated and die in custody - or die stuffed into a suitcase or spare tire in a stifling trunk, or taped to the smuggler's body. Since people who smuggle an animal or two are rarely thrown in jail, the only real losers are the animals. You can change this by not buying these animals and educating your friends and the community to not buy them when they travel. SAN LORENZO, Valle -- Last week during a routine traffic check, soldiers here next to the Gulf of Fonseca found a couple taking hundreds of baby iguanas to the Salvadoran border. From there they were to be shipped to the United States to become pets. The pair had about 1,300 iguanas. The animals were stuffed into cloth bags and the bottoms of backpacks with clothing piled on top. Despite that and the intense heat, fewer than 50 had died. Also in the pickup, which had a camper top, were 20 young lizards and an eagle. The couple were carted before a judge, who set them free citing their first offense. The animals were also set free in the army's reserve on the gulf. "This is just a small part of the trafficking," said Justo García of CODDEFFEGOLF, which fights to preserve the Gulf of Fonseca from environmental damage by shrimp farmers. "This area is an important point in the trafficking of animals," he added. Also trafficked are snakes, anteaters and other animals native to southern Honduras and Nicaragua. In addition to feeding the U.S. Demand, many of the animals are served at Salvadoran tables, where they are considered a delicacy. García, who recruits and educates members of the environmental group, said the traffickers caught last week worked the Nicaraguan border near Guasaule but were a small-time operation. He said some people will carry hundreds of thousands of baby iguanas across blind, or unguarded, border crossings into El Salvador, often on horseback. García estimated the fees for those who capture animals at Lps. 60 for a buzzard; LPs 40 for a boa constrictor; LPs 4 to 6 for a baby iguana; LPs 14 to 18 for an adult lizard; LPs 15 for an adult anteater; LPs 35 to 40 for an eagle; LPs 15 to 30 for a baby parakeet; and LPs 300 to 600 for a baby parrot, which is hard to catch. He said he is unsure how much the traffickers get but that it must be substantial because some have bought their vehicles with their profits. This is the prime time of the year for baby iguanas, who began hatching in March and later climbed trees to grow into adults, safe from predators on Earth. But man captures them in the trees. García says that although they aren't officially listed as endangered, his group believes they could soon be in trouble if not enough potential mothers survive to lay eggs next year or the next. García said no more iguanas or lizards are left on the gulf's protected Isla de Exposición. He said people came to the island and stripped it of those reptiles. Further, a politically connected family has claimed it owns the island, located near Amapala, where many rich Hondurans have built luxurious second homes. García said shipment of animals from El Salvador is easier than from Honduras because of a lack of vigilance and that babies are wanted because it's simpler to ship several at one time and they're easier to domesticate.